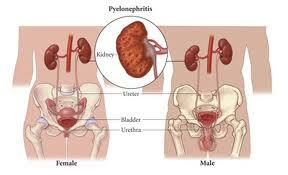 Pyelonephritis is a medical condition, in which bacterial infections of 1 or both kidneys occurs. The bacterium called Escherichia Coli, that is usually discovered in the large intestine, resulting in approx. 90% of kidney infections among individuals living in the community, but only 50% among hospitalized individuals. The infection commonly ascends from the person’s genital part to the bladder. 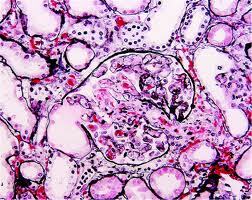 Pyelonephritis may also be carried to the kidney from another body’s part through the blood. 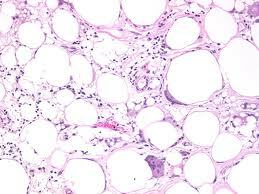 For example, a staphylococcal infection of skin may spread to the kidney through the blood. Other causes that increases the risk of the Pyelonephritis include diabetes, pregnancy, and any conditions that decreases ability of the body to fight infections. The symptoms of Pyelonephritis commonly starts abruptly with vomiting, chills, nausea, fever, and kidney’s lower part pain on either back side. Approx. 1/3 of patients with Pyelonephritis also experience lower urinary tract infection symptoms, such as painful, frequent urination. One or both kidneys can be enlarged and tender. In some cases, the abdominal muscles are tightly contracted. A patient can have intense pain, resulted from one of the ureters spasms (renal colics). A spasm can be resulted from the passing of a kidney stone or irritation from infection. In children, Pyelonephritis’ symptoms are frequently mild and more difficult to define. In a chronic Pyelonephritis (long-standing infection), the fever can come and go, or not occur at all and the pain can be vague. Chronic Pyelonephritis happens only in individuals with major underlying defects, such as urine backflowfrom the person’s bladder into the ureter in young children, large kidney stone that persist, or urinary tract’s obstruction. 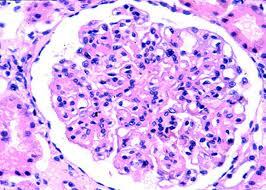 Chronic Pyelonephritis may damage the kidney so severe that it may no longer function normally and cause kidney failure. Specific symptoms of a Pyelonephritis (kidney bacterial infection) lead a doctor to make 2 common laboratory examinations to define whether the kidney is infected: culturing urine’s specimen bacteria to define which bacteria is present and to determine whether the kidney is infected. Additional examinations should be done for individuals with intensive back aches from renal colic; males, because they are very rare progress a kidney infection; those patients whose symptoms quickly returns after treatment with antibiotics finished; and those who do not respond to antibiotics treatment within 2 days. X-Rays and ultrasound scans should be done in such situations. Such studies can show structural abnormalities, kidney stone, or other urinary obstruction causes.